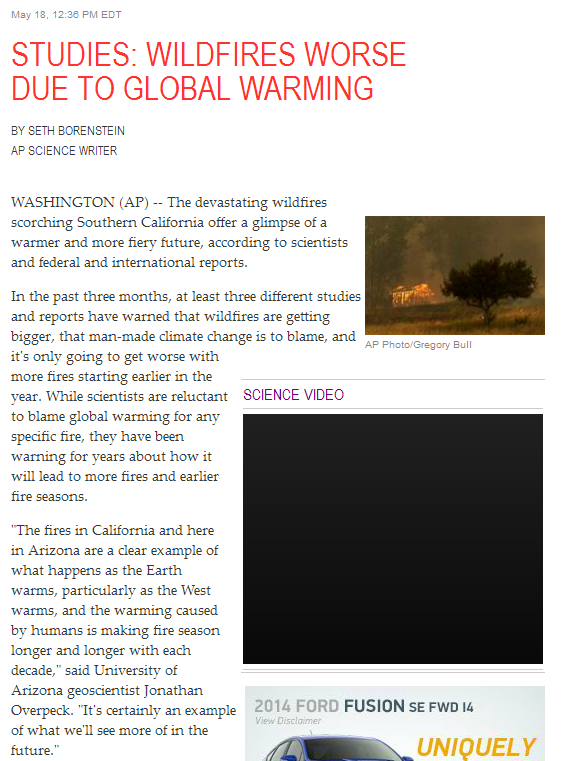 AP misleads the public, again, saying man made global warming worsens wildfires | Watts Up With That? 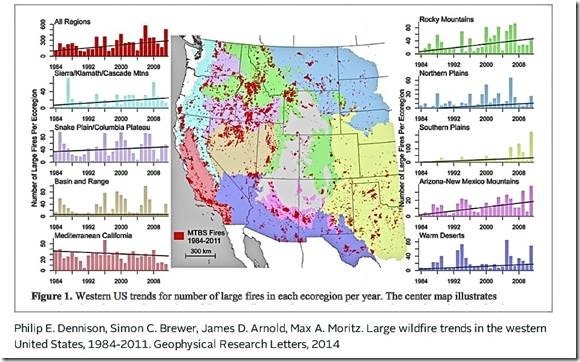 The study addresses large wildfires (greater than 1000 acres) in the western U.S. across nine different study defined ecoregions which have occurred since 1984. The data shows that the total regional burn area has increased by about 87,700 acres per year with an increase of 7 additional regional fires per year during this period. The western U.S. area and regional ecoregions addressed in the study are shown below. While the climate alarmist press loudly proclaim that “man made climate change is to blame” for these findings the actual study is much more circumspect about what the contributors are that could be impacting the results. 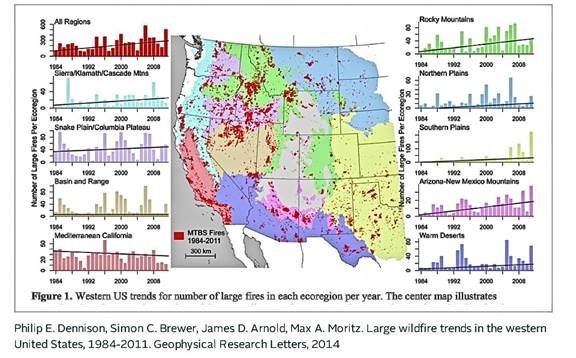 Even in the abstract to this study other factors are identified that the authors believe contribute to these results including the impacts of invasive species and consequences of past fire management practices in addition to changes in climate and in particular increasing drought severity. Nowhere in the report do the authors specifically articulate that “man made climate change is to blame” for the studies findings. The study does not make any attribution to “man made” actions being responsible for the large wildfire trend results. Instead the study identifies regional invasive species, past fire management practices, increases in western U.S. regional drought severity and increasing regional temperatures as driving the results. Additionally Dr. Christy’s testimony addressed the hundreds of years long natural climate variation of severe droughts in the Sierra Nevada mountains in California and the Rocky Mountain upper Colorado River basis. His testimony showed that the western U.S. will likely see increasing droughts in the coming years because of natural climate variation reflecting patterns long exhibited in the regional paleoclimate drought record as noted below from his testimony. 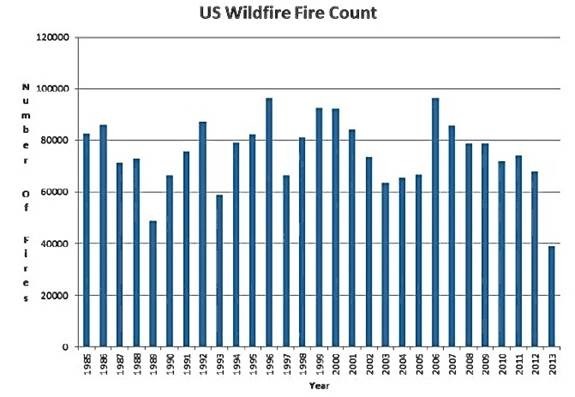 The climate fear propaganda media have again misled the public with unwarranted alarmist headlines alleging claims which do not reflect what this study of large western U.S. wildfires actually presented. The alarmist media twisted and misrepresented the studies information in an effort to try and frighten the public into supporting its scientifically unsupported climate fear political ideology. May 19, 2014 in Alarmism, Climate News, Wildfires. The National Climate Assessment shows that precipitation has increased [or remained stable] in most of the US since 1960, including in California and the dry Southwest. Invasive species have had a big impact across the US. Grant proposals to study natural climate variability impacts on western wildfire potentials won’t get a high panel score with John Holdren whispering into the NSF’s ear. Grant proposals to study Western Wildfire potentials as a response to projected Climate Change are much more likely to get a better score. If you were a academic researcher needing tenure and a grant, which would you chose? The incentives are obvious with the current political climate. We’re getting the same BS studys here in Australia. The warmies are just changing places and dates on their studys. Otherwise its word for word on the studys done here. Some wag earlier this year had a thought bubble that there was this giant invisible cloud of CO/2. That works its around the world increasing the ferocity of bushfires where ever it settles over. Seems like its moved from Australia to America. I heard it had turned up in Italy not long ago or was that Greece. It really is becoming quite tedious. Lets talk about the global warming that froze America…..
How many fires were man made with a match? I don’t understand. The raters-who-should-not-be-named put this abstract down as 100% agreeing with the 97% consensus. The by line says it all. What are the trends in deliberately/accidentally lit fires, numbers of campers and miles of power lines over the last few years? Vandalism generally and graffiti in particular has exploded in recent years, therefore, is it not reasonable to assume that it would be the same with arson ? I do not have a degree so i guess i’m not qualified to ask these questions or even have these thoughts.Nonetheless my instincts tell me that an increase of 0.8 of a degree will not lead to spontaneous combustion. Yes. Because we climate soothsayers have a magical pool we can peer into that allows us to view the awful climate future that awaits us. That, plus our excellent XBox climate models say so, and they have been almost always right so far; well mostly, they just might need a bit more tweaking is all. Bad forest management has led to approximately a 10x increase in stem density compared with the historical condition, such as John Muir described. Gone are the park-like forests where a rider could gallop a horse freely through the trees. Misguided environmentalists believe a “natural” forest without the influence of man would be best. The problem is man has interfered for the past century by suppressing fires and failing to thin the forest. The fact is, precolumbian people used fire to manage fuels for thousands of years. Forests thinned by fire (set in winter) kept meadows open for game animals to graze and to increase the abundance of useful plants. The forest / meadow interface has the highest biodiversity and these areas are shrinking. Perhaps the Rim fire will have a silver lining. If bureaucrats and legislators can understand we must thin the forest to improve forest health, with the side benefit of increasing our water supply, the tragic loss of so many forested acres may have at least a partial positive outcome. The USFS seem to have a different attitude regarding forest management than the NPS. The latter do understand the failure of fire suppression and the need for thinning. The USFS seem still enthralled to the environmentalist extremists. Are enviro-extremists running the USFS from Washington, DC? Why is this such a big problem in the western states and not the rest of the US? Because the federal government owns and manages most of the land in the western states, but has relatively little land in the mid-west and eastern states. A wildfire season that began with dire warnings that dry conditions had set the stage for a year of flames across California and the West turned out to be among the quietest of the past decade.. Although 2013 was marked by two high-profile blazes, one in California and the other in Arizona, nationally the total wildfire acreage, 4.15 million, is far below the 10-year average of 6.8 million acres. The torturing of cherries to get them to confess desirably is a cruel and unusual punishment consistently, routinely, normally (but creatively abnormal by any actual norms derived honestly from the actual data Pravda style) leaving one to ponder intriguingly why exactly. Shoddy journalism? Ignorance, incompetence? Or something more sinister, where complexity favors the sinister. The 2013 wildfire season witnessed some high profile fires extremely threatening to infrastructure and development rather than remote areas demanding commitment of firefighting resources depleting allocated funds at the federal and some state levels as here in Oregon despite being one of the milder below average wildfire seasons in terms of acreage burned going back to 1960. The media coverage of last year’s fire season somehow left the opposite impression as will assuredly this year’s coverage regardless of severity by any accurate measure actually supported by the data. As the names of the main Communist newspaper and the main Soviet newspaper, Pravda and Izvestia, meant “the truth” and “the news” respectively, a popular Russian saying was “v Pravde net izvestiy, v Izvestiyakh net pravdy” (In the Truth there is no news, and in the News there is no truth) Caveat emptor particularly in election years which have somehow achieved a perpetuality without respite. USFS is under assault from environmental groups suing and slowing down or halting good management practices like select logging. I am curious how they calculate how much carbon is captured in commercial use (construction) of logging products. The drought conditions correlate more directly to consumption by humans rather than the CO2 boogey-man. So i guess you could say the severity increase in fires is “man-made”. The following link is to the big fire in 1910 that shaped the forest management practices for the following 80-90 years. 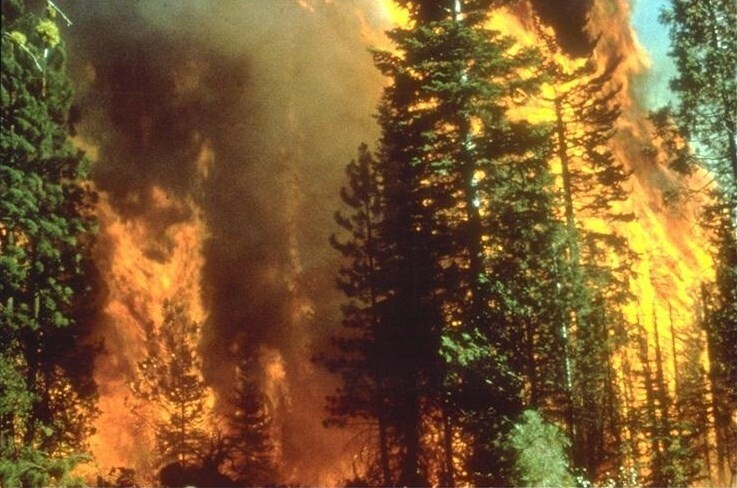 Lodgepole pine forests use fire to reproduce and it is also a major part of the ecology in sequoia forests and other dry climate evergreen forests. Hopefully we can learn from our past mistakes and manage these vast forests better but hysterical stories like the one from the AP don’t help. Pre 1700, “many millions of acres” burned every year in California. As a result many forests within California were generally open and park like due to the thinning effects of recurrent fire. Decades of fire suppression and other forest management have left a legacy of increased fuel loads and ecosystems dense with an understory of shade-tolerant, late-succession plant species. The widespread level of dangerous fuel conditions is a result of highly productive vegetative systems accumulating fuels and/or reductions in fire frequency from fire suppression. In the absence of fire, these plant communities accrue biomass, and alter the arrangement of it in ways that significantly increase fuel availability and expected fire intensity. As such, many ecosystems are conducive to large, severe fires, especially during hot, dry, windy periods in late summer through fall. Additionally, the spatial continuity of fuels has increased with fewer structural breaks to retard fire spread and intensity. The increased accumulations of live and dead fuels may burn longer and more completely, threatening the integrity and sustainability of the ecosystems. This is all from the California Dept of Forestry and Fire Protection. Spot on, Nick! Nowhere in the abstract does this say these changes are due to human greenhouse gas emissions. to droughts, which can not, in turn, be associated with current global warming climate change in the first place. The fact that these fires were set on purpose and that the doomsayers use these fires to push their global warming propaganda kinda makes me wonder, where was Al Gore when these fires were set? Actually after looking over this topic I have to conclude co2 does lead to stronger wildfires. This is for a completely different reason then cited though imo, the case they made is weak. As we know though, the world is greening up, especially the drier areas. So there is more to burn. The fact there is not a paper on this (that I could find) imo is another example of how biased the field is. Because to point to this, you then have to further highlight that co2 has positives, and that doesnt appear to be a debate “the team” wants. It was the age of information. It was the age of ignorance. The wildfires are man made and I believe they a few people in custody but it aint for CO2. The increase in wildfires is attributable very specifically to environmentalist extremism, which has interfered with prudent forest management practices (such as thinning underbrush and removing dead trees) and with natural fire cycles which are much less destructive than the fires resulting from environmentalist practices. Hmm… Could this be a factor? More dribble from the bias press. The video clip posted by Janet says it all, 50 years ago! 1. agitation and propaganda, especially for the cause of communism. 2. (often initial capital letter) an agency or department, as of a government, that directs and coordinates agitation and propaganda. 3. a person who is trained or takes part in such activities.